This patient has undergone two hair transplant procedures and received a total of 6527 grafts. He underwent the first procedure around 3.5 years ago, having 3394 grafts transplanted into his frontal area. A 0.85mm punch was used for graft harvesting. PRP and ACell were administered at the time of the transplant; however, the patient did not continue these treatments on a yearly routine basis. 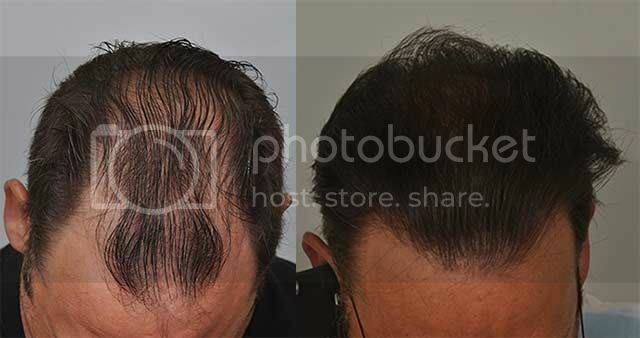 Although the patient uses Propecia and Rogaine to curb his hair loss, his scalp hair has continued to thin in the crown region, leading him to return for a second procedure. During his second session, the patient had some coverage added behind the area previously treated as well as extra coverage added to his frontal region. 3133 grafts were placed, and again, a 0.85mm punch was used for graft extraction. The pictures shown reflect the results of his first procedure only. Current photos will be provided once the second procedure has had time to show some visible growth. but what will he do when propecia stops working or if he needs to come of it for any reason? Wont he be left looking like a mess? Yes newstart, i agree that this results stand out. what really makes Dr. Cole’s hair transplant results better is how natural they look, you must see Dr. Cole’s patient in person to understand that. i saw many forum superstars patients from famous clinics and some of them really had good results in terms of density but i could tell they had an HT. Back to our topic, this patient is all set and done. His 2nd pass should really add more density in the weaker crown area. 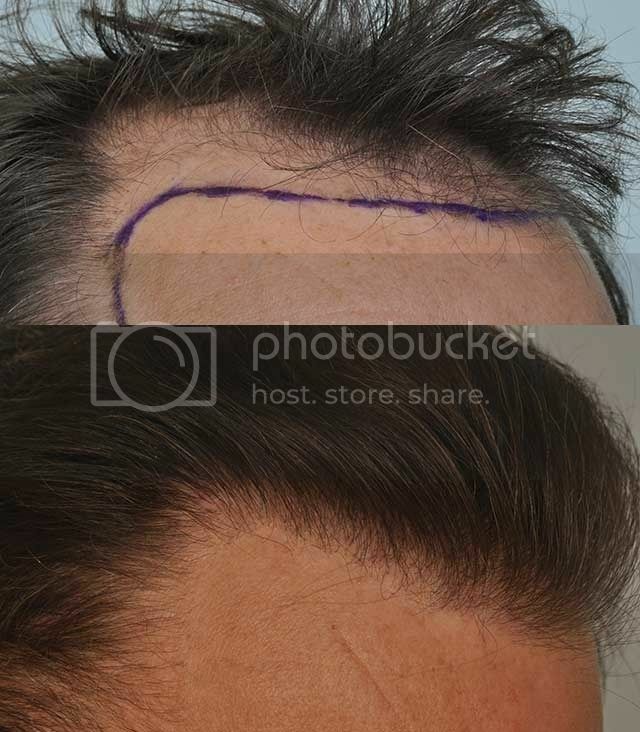 i don’t think Propecia really matters in this case, i mean it is well known that Propecia is mainly effective on the crown area and this patient clearly lost some existing hairs in that region so it didn’t really worked for him anyway. In my case, i used propecia after my HT for one year, then i stopped using it because of side effects and it’s been 10 years from my last procedure, i lost existing hairs since i stopped Ppropecia but it is not something that can’t be fixed with another small session. the gain and loss from propecia is small. This is definitely a very natural looking result Dr. Cole has achieved. No one would ever guess this guy had a hair transplant done. 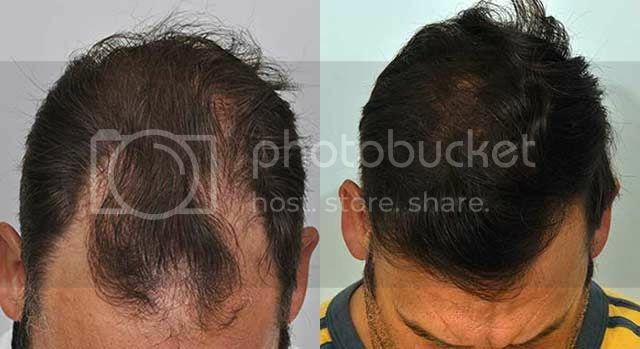 I agree with forhair, propecia probably offers little benefit to this patient if he has already experienced such extensive loss in his crown area. I can wait to see how well his future results will look from his second ht. He was pretty happy. He took me to the Hawks playoff game last night. Other than a great game, the best part was a huge hug from his girlfriend, who really loves his hair. quote from the original post "PRP and ACell were administered at the time of the transplant; however, the patient did not continue these treatments on a yearly routine basis. " Are you saying that his results would have been better had he continued with PRP and Acell? newstart, that applies to all hair transplants, you still need to stay on propecia and other products hoping that you can keep the hair for as long as possible until the scientists come up with something more effective for hair loss. A hair transplant can buy you some time but it is still not the cure.